Jim Morphesis JS: Tell me about the early years of your life and how they shaped you. When did you know you were an artist? JM: As a child growing up in the Philadelphia area, I would draw, paint, make models and catch bugs and slimy things. By the time I was in the fourth grade, I knew most species of frogs and butterflies in the Northeast United States. My father was an exceptionally talented illustrator whose burgeoning career was interrupted by war and a call to service. He remained in the military long enough to achieve the rank of Air Force Colonel. This had me growing up in a disciplined house that, to this day, affects my studio practice. In time, my father returned to art, becoming a designer for the government. This meant that I had access to wonderful, good quality art materials and I took full advantage of the situation by using these materials to draw and paint everything that interested me. At thirteen, I decided that I would become a working artist following my retirement as a professional football player. My high school football career convinced me to give up the dream of being a Philadelphia Eagle and I headed straight to art school. I attended the Tyler School of Art for my BFA degree and then headed to the West Coast to be a part of the first graduate class at the California Institute of the Arts. 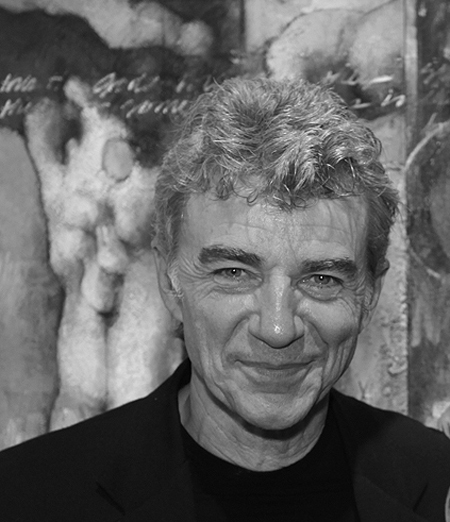 CalArts landed me in Los Angeles and, while I lived and worked in New York for eight years, I have spent most of the past four decades working as a Los Angeles based artist. No Sanctuary, 1981, Oil, acrylic, wood, nails, wire, tape, and gold leaf on wood panel, 26.5 x 29 inches Collection of Dr. Ray Mnich, Palm Springs JS: What role has your Greek Orthodox faith had in your artistic development? 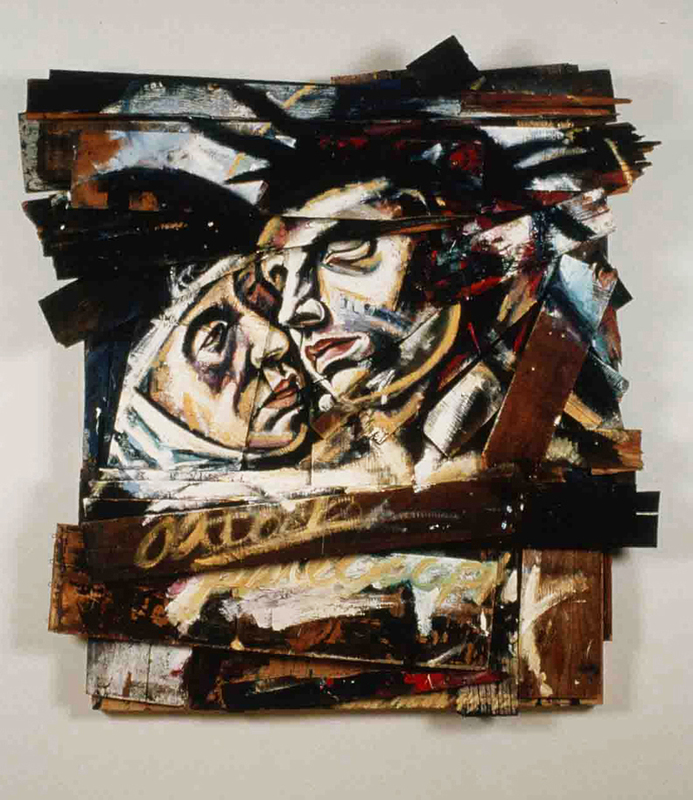 Destiny, 1982, Oil, magna, alkyd resin, and wood on wood panel, 68 x 64 inches Collection of Laifun Chung and Ted Kotcheff, Beverly Hills JS: You are known for experimenting with media. Tell me about some of your experiments. JM: I never consider combining different mediums and materials as experiments. At the same time, I suppose all that we do as artists can be seen as experimental; the outcome is never a certainty. The materials used in my mixed media paintings were in response to the natural growth of the work. There was a time, years ago, when I wanted to bury my history and make way for something new. I began collaging all the personal letters that I had been keeping into a series of works on paper. This was a cathartic endeavor that lead to the works in which I rendered versions of historic paintings such as a Bellini, Pieta and the Velazquez, Christ on the Cross, onto surfaces constructed of found timbers, old furniture and doors. These were objects that brought their own history into my work. The process was natural and never seemed experimental. There was, however, that one time very long ago when I tried to create a thick silver colored paint matter using rhoplex, glass sand blasting beads and aluminum powder. The concoction exploded all over the walls of my studio ...twice. That was something that I might consider an experiment. 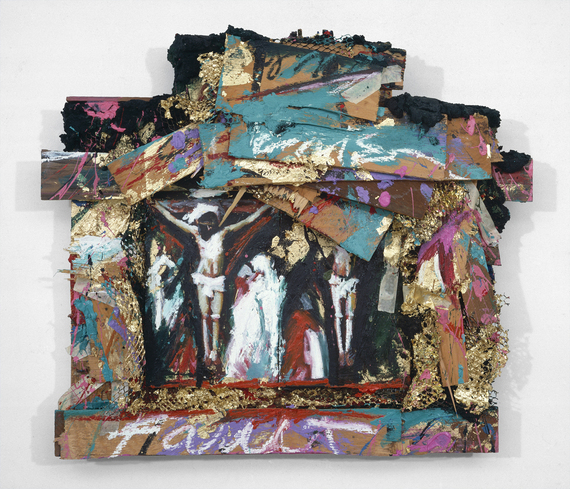 Big Dream, 1983, Oil, magna, wood, fabric, and gold leaf on wood panel, 68 x 86 x 9 inches Collection of the San Antonio Museum of Art JS: Is it fair to say that your art really began to take off when you began working with the imagery of the crucifixion? 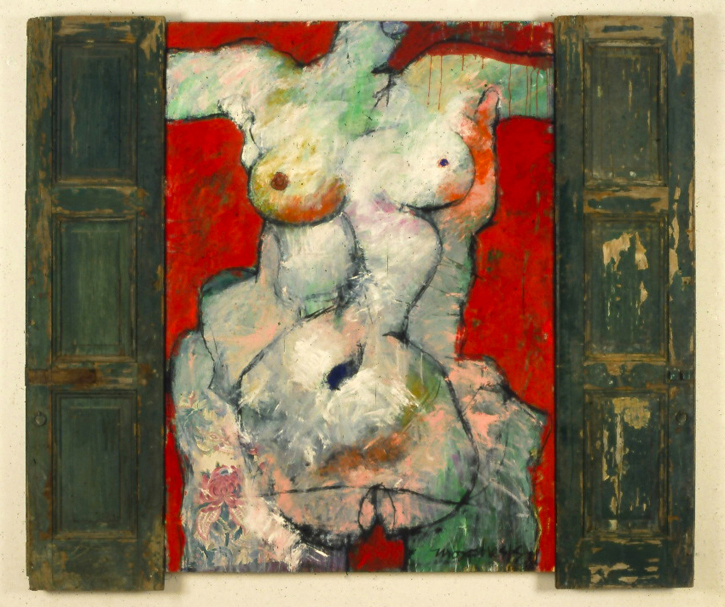 Female Torso with Green Doors, 1989, Oil, acrylic, gouache, charcoal, and collage on wood panel with wood doors, 71 x 83 inches Collection of the Orange County Museum of Art JS: You have been working with Peter Selz, who curated your show. What kinds of revelations has working with Peter given you? JM: Working with Peter Selz has been an honor and an opportunity for which I am very grateful. 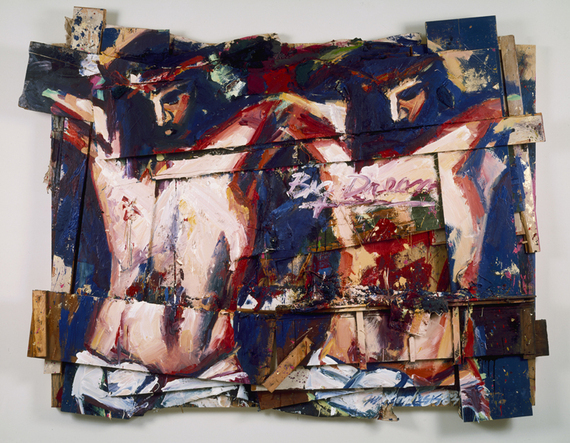 I often asked Peter about artists who have influenced me as a painter. Because Peter personally knew people such as Jean Dubuffet, Willem de Kooning and was a close friend of Mark Rothko, these artists seemed very present during our conversations. There is a humanist connection among all of the Expressionist artists that Peter is interested in. Peter's enthusiasm for my work was most encouraging and reminded me that I am a part of this continuing tradition. We all need an occasional shot in the arm by someone for whom we have the greatest respect. 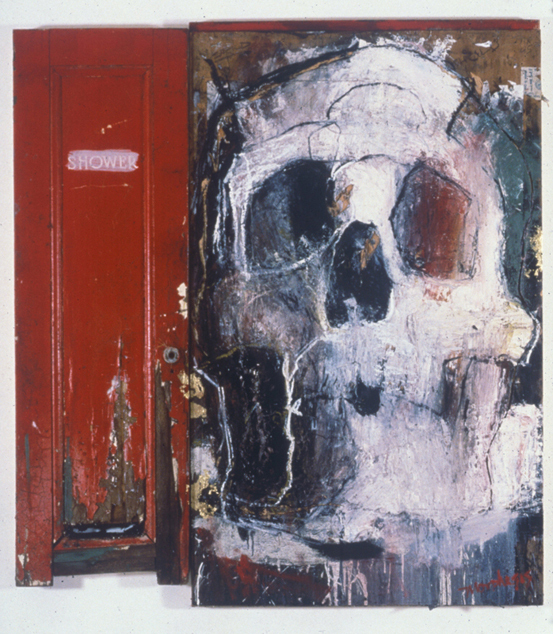 Skull and Red Door, 1987, Oil, magna, enamel, charcoal, paper, wood, and gold leaf on wood panel, 80 x 72 inches Collection of the Museum of Contemporary Art San Diego JS: Are you a Neo-Expressionist? If not, is there a school of painting you feel most connected to? 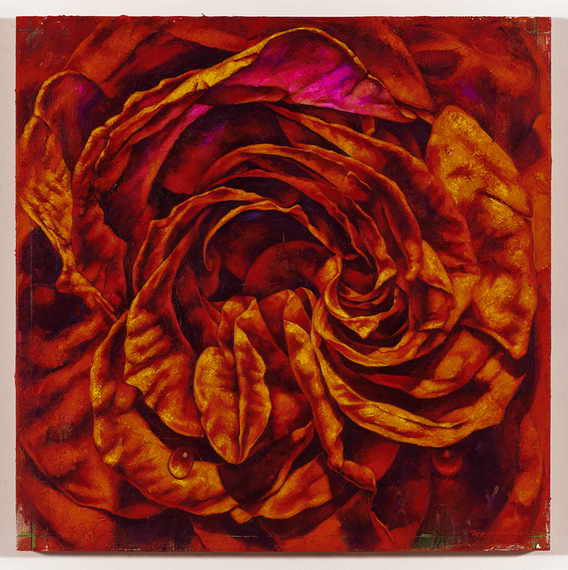 Rose XV, 2012, Oil, enamel, gouache, and collage on wood panel, 26 x 26 inches Collection of the artist JS: What has your most recent work been about? 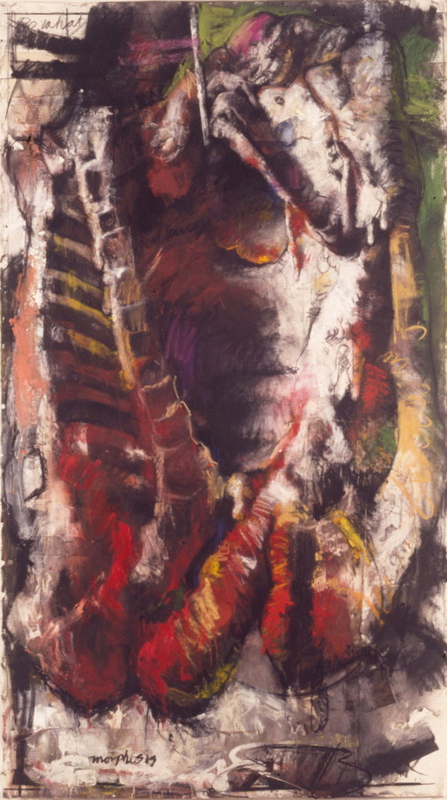 Marsyas III, 2001, Oil, gouache, charcoal, pastel, joint compound, and collage on paper, 80 x 45 inches Collection of Brent Giddens JS: How do you hope viewers will respond to your show?